Home/Science of Sound/Advanced Topics in Sound/How does sound travel in shallow water? Illustration of a side view of the continental shelf. Image public domain. In the field of ocean acoustics, “shallow water” commonly refers to coastal waters extending from the shoreline out to the edge of the continental shelf to a depth of about 200 m, where the seafloor slope increases. By this definition, shallow water accounts for approximately 8% of the ocean and seas. These regions are important because they are close to human populations and account for much of the exclusive economic zones (EEZs) of coastal nations. These regions are important for marine habitats, fisheries, national security, commerce, energy development, and recreation. 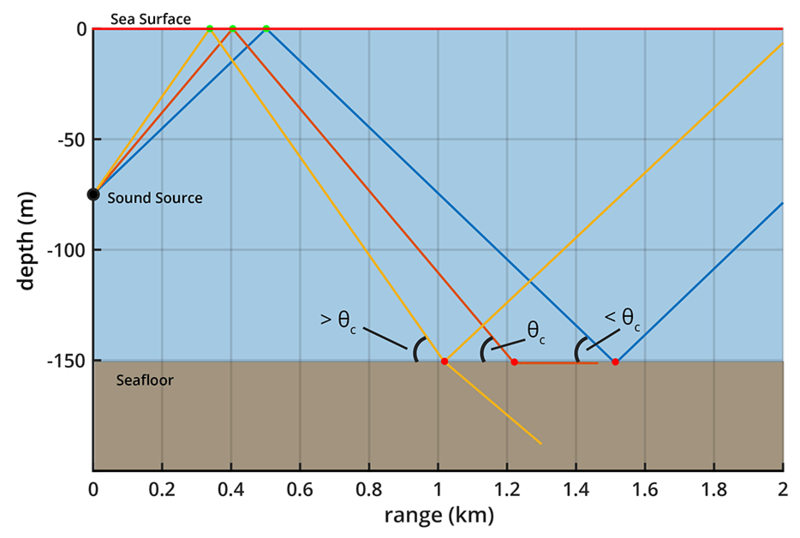 The following sections include information on the structure of the shallow water sound channel by season (including the sea surface and seafloor), how sound travels in shallow water, and how the shallow water sound channel varies in different parts of the ocean. Speed of sound in water profile when the speed of sound is constant. Credit DOSITS. The shallow water sound channel The speed at which sound travels in the ocean is faster with increasing temperature, salinity, and pressure (See How fast does sound travel?). Shallow waters are often well mixed by wind and waves in the winter, with temperature and salinity largely independent of depth. As a result, sound speed is also often largely independent of depth. This is very different from deep water, where there is a minimum in sound speed at a depth of about 1000 m in mid-latitudes, forming a sound channel or waveguide through which sound can propagate over long distances without interacting with the sea surface or seafloor (See How does sound travel long distances? The SOFAR Channel). In shallow water, sound travels on paths that interact with the seafloor and ocean waves at the sea surface. Sound speed is largely independent of depth in shallow water in winter. This is particularly true in the mid-latitudes (for more information below on geographic variability). When sound speed is constant, sound travels in straight lines. Sound that travels upward from a source travels in a straight line until it hits the surface. Upon reaching the sea surface, the sound is reflected and travels back downward toward the seafloor (See How does sound move? Reflection). Almost no sound travels into the air. Sound that travels down from a source propagates in a straight line until it hits the seafloor. Upon reaching the seafloor, some of the sound is reflected and travels back upward. Not all of the sound is reflected, however. 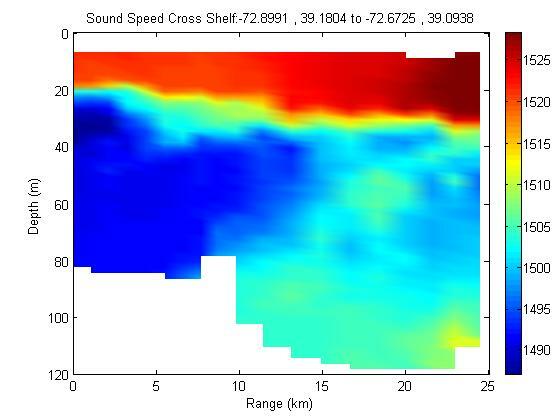 Some of the sound travels into the seafloor. The following figure has two parts. On the left is a plot of sound speed as a function of depth. Sound speed is the same at all depths. On the right are the paths followed by sound waves as they travel away from the source. These waves travel in straight lines until they are reflected at the sea surface or the sea floor. Left: Constant speed of sound through the water column. Right: Paths followed by sound waves as they travel away from the source in shallow water at a constant sound speed. Credit DOSITS. Vertical distances in this figure are greatly exaggerated compared to horizontal distances. This causes the angles from the horizontal at which sound waves travel to look much steeper than they really are. Sound loses energy when it hits the ocean surface or seafloor. Whenever sound reflects from the rough ocean surface, some sound energy is scattered and lost. Similarly, whenever sound hits the rough seafloor, some sound energy is scattered and lost. In addition, some sound energy can travel into the seafloor and be attenuated. Absorption in the seabed is much greater than absorption in seawater [for more about absorption see Sound Absorption]. Whether or not sound goes into the seafloor depends upon the angle to the horizontal at which the sound is traveling. When the sound speed in seafloor is greater than the sound speed in the water above it, which is usually the case, there is a special angle, called the critical angle. The critical angle is usually about 15º. When sound travels at angles to the horizontal that are smaller than the critical angle, the sound is almost perfectly reflected (shown in the blue line in the figure below). When sound travels at angles to the horizontal greater than the critical angle (shown in the green line in the figure below), some of the sound enters the seafloor. Sound that travels at angles greater than the critical angle disappears into the seafloor after a few reflections. This is the major source of energy loss in shallow water. Uncertainties in the properties of the seafloor, including sound speed, density, and attenuation, make it difficult to accurately predict how sound travels in shallow water. 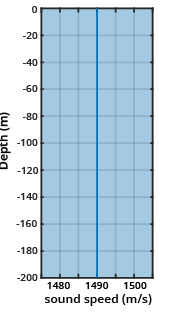 An illustration of the reflection and refraction of sound waves when they encounter the seafloor at the critical angle and greater and less-than the critical angle. Credit DOSITS. Sound waves traveling in the sound channel follow many different paths. Although sound travels away from a sound source in all directions, only sound traveling away from a source on paths that leave the source at specific angles will reach a receiver at a specific location. Left: Constant speed of sound through the water column. Right: Illustration of the paths between a mid-depth source and a mid-depth receiver at a constant sound speed. Only the sound waves reaching the receive are shown. Credit DOSITS. 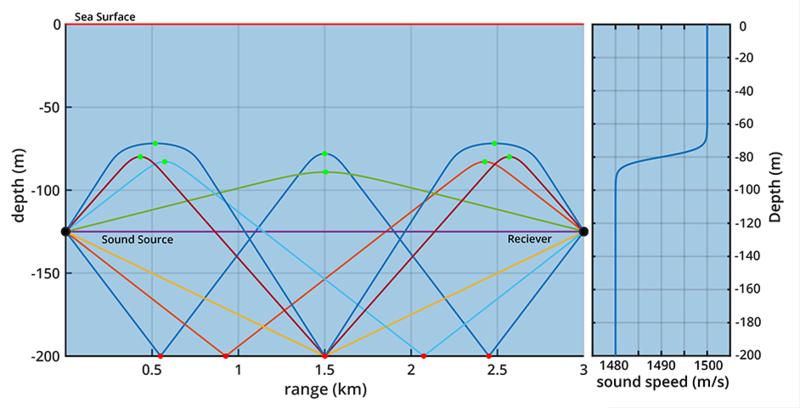 The sound waves traveling on different paths from source to receiver have slightly different travel times. A single impulsive source will therefore be heard as a number of separate arrivals. The sound that travels directly from the source to the receiver travels the shortest path and arrives first. Sounds that reflect from the sea surface or seafloor travel further and arrive later. This is different from sound propagation in deep water where the shortest path on the sound channel axis arrives last (See Sound Travel in SOFAR Chanel for more information). The way in which sound speed changes with depth is not the same everywhere in shallow water because the ocean temperature and salinity profiles that determine sound speed can differ greatly from one location to another and from one time to another. The variability is much higher in coastal regions than in the deep ocean. Sound speed is independent of depth in shallow water when wind and waves are strong, resulting in fully mixed conditions. This most often occurs in wintertime near the coast in water that is less than roughly 30 m deep. In summertime and in deeper waters further from the coast, the sun warms the water near the surface, but the warming does not extend all the way to the seafloor. Sound speed is higher in the warmer water near the surface than in the colder water near the seafloor. There are often three layers, with a mixed layer near the surface with relatively high sound speed, a layer in which temperature and sound speed decrease, and a cold layer above the seafloor with lower sound speed. Left: Illustration of ray paths for a source located below the thermocline, showing the rays being refracted toward the seafloor when there is a summer thermocline. Right: Speed of sound through the water column when the speed is not constant. Credit DOSITS. A sound wave traveling through the ocean is refracted (bent) whenever it encounters changes in the speed of sound (See How does sound move? Refraction). Sound waves are continually refracted toward the region of lower sound speed. Differing sound-speed profiles therefore cause sound waves to travel on quite different paths. For a three-layer profile, sound that travels upward from a source located in the cold water near the seafloor is bent back towards the seafloor when it travels up into warmer water with higher sound speeds. The result is that the sound interacts repeatedly with the seafloor and rapidly becomes weaker. In shallow water, sound speed often varies as a function of geographic location as well as depth. For instance, on the continental shelf off the east coast of the U.S., the water’s temperature and salinity are influenced by the Gulf Stream and associated eddies. These oceanographic features can form fronts between the colder shelf waters and warmer Gulf Stream current flow. Therefore, the sound speed profiles can be complicated, changing in time and space and resulting in complex acoustic propagation. Graph of the sound speed on the shelf off the New Jersey shore. Image from Kristy A. Moore, James H. Miller, Gopu R. Potty, James F. Lynch and Arthur Newhall, “Investigation of three‐dimensional propagation effects at the New Jersey shelf break front,” Journal of the Acoustical Society of America 2007 121:5, 3126-3126.